Rising gas prices may keep families closer to home this summer but that doesn’t mean that you can’t have a great time exploring your local area. While my family is planning several short trips throughout our state, I’m looking forward to sticking close to home and familiarizing myself with the museums, restaurants and attractions that I may tend to overlook. Whether you’re planning to vacation or staycation, I’d like to entice you to visit my hometown with a list of family friendly staycation ideas in Mansfield, Ohio. Conveniently located between Cleveland and Columbus in North Central Ohio lies Mansfield, seat of Richland County, and a hub of family fun and hidden treasures. Today I’ll share many of the places that my family is familiar with have enjoyed visiting over the years. Kingwood Center Mansion & Gardens 900 Park Avenue West, Mansfield 419-522- 0211, Parking fee ranges from $5- 10 and grants you access to the grounds and gardens. Tours of the mansion are $1 when offered. See the website or call ahead for the most up to date information. 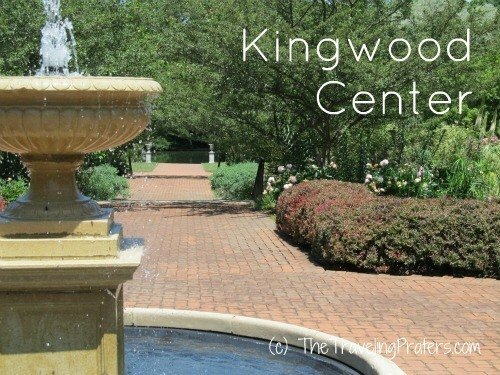 My family has spent many days at Kingwood Center, picnicking on the grounds, touring the mansion, feeding the ducks at the pond or trying to catch a glimpse of the wandering peacocks. Mansfield Blockhouse South Park corner of Brinkerhoff and Park Ave., Mansfield. 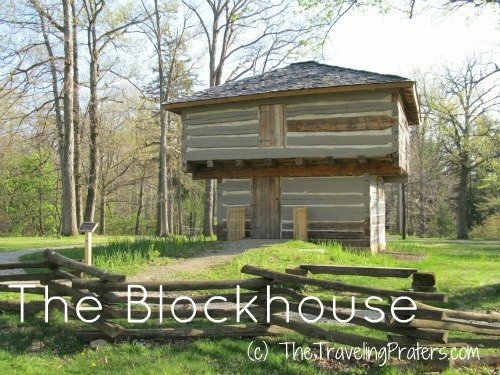 Built in 1812, the blockhouse has served as a courthouse, jail and fortress against Indian attacks and serves as a vital part of Mansfield history. Mansfield Fire Museum and Education Center 1265 West Fourth St., Mansfield 419-529-2573, Free admission, donations welcome. I don’t know what it is with boys and fire trucks, but when my boys were younger, they LOVED this museum! You’ll learn about the history of fire fighting and take a stroll through historic downtown Mansfield along cobbled streets for a special peek at bygone days. 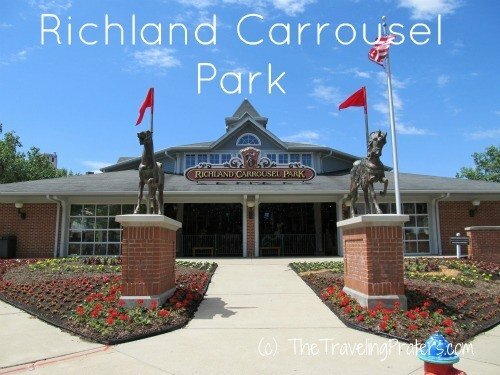 Richland Carrousel Park 75 N. Main St. Mansfield 419-522-4223. Open 7 days a week, hours depend upon season. Rides begin at $1 but are discounted when you purchase six or fifty. On street metered parking is available so pack some change. Who can resist a ride on an old fashioned carrousel? With over 50 hand-carved figures, the Richland Carrousel has become the centerpiece of downtown Mansfield since opening in 1991, the first to be built and operated in the US since the 1930’s. Field Trips 44 W. Fourth St Mansfield 419-961-2885 Open Wed.- Sat. 10- 6 and Sunday 1-6. $6 for ages 2 and up. 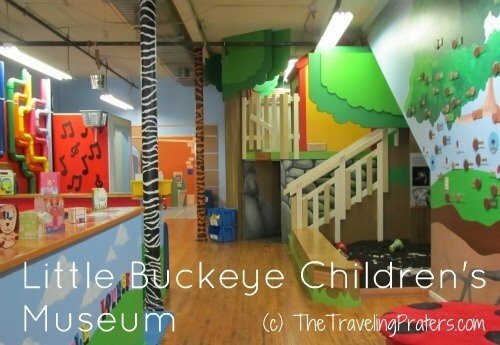 If a museum ever made me wish my kids were younger, the Little Buckeye Children’s Museum is it! Designed for ages 0-12, this hands-on museum allows children to explore through playing in a number of interactive exhibits that include a play area for babies, a dinosaur dig, doctors office, grocery store, bank, beauty salon, water play station, a theater, and more exhibits to come. Mansfield Memorial Museum 34 Park Avenue, Mansfield 419-524-9924, Free admission. The Mansfield Memorial Museum is often overlooked but once you step foot inside, you won’t be able to stay away! Housed in the historic Soldiers & Sailors Memorial building, this unique, eclectic, and historical museum is home to ELECKTRO, the world’s first true robot. ELEKTRO was created by Westinghouse, a company that was once prominent in Mansfield, specifically for the 1939 New York World’s Fair. 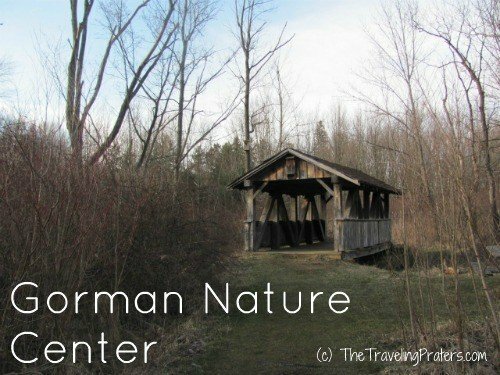 Gorman Nature Center 2295 Lexington Ave., Mansfield 419-884-3764 , Free admission. With over three miles of hiking trails through a range of habitats, wildlife is abundant at Gorman Nature Center. The indoor displays offer visitors a look at some of the area’s wildlife, while the building itself offers you a look at green, environmental friendly features. Visit the Blueberry Patch and see for yourself why people travel from all over Ohio to pick their own blueberries at this location. Families are welcome to pick from over 20 varieties of blueberries which ripen at different times throughout the growing season. This independent book store is the area’s only new and used bookstore that offers trade credit. I’ve been known to stop in on many occasions to trade an armload or two of books. Ohio Bird Sanctuary 3774 Orrweiler Rd., Mansfield 419-884-HAWK, Free admission. 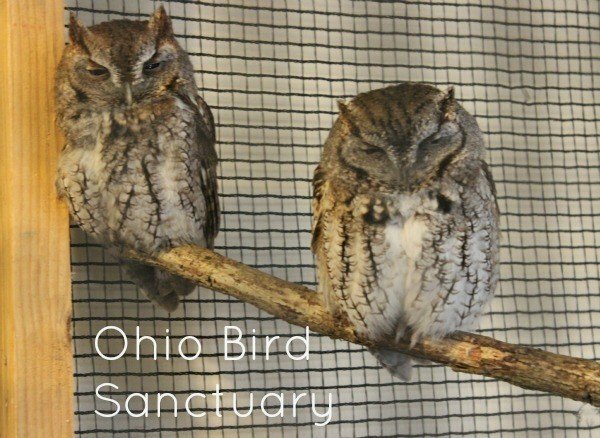 The Ohio Bird Sanctuary is a refuge for injured birds. They offer educational programs, hiking trails, a live hawk and owl bird display, and a song bird aviary that you can walk through. For a very small price you can buy a cup of meal worms which will guarantee you get a lot of attention from the existing residents. The Warrior may be known for their award winning GPS Pizza (green peppers and sausage) and Lasagna Pizza but you won’t want to pass up one of their amazingly yummy ice cream treats. Located on Park Avenue, minutes from Mansfield, you can’t miss this diner, just look for the crowds and the blue building with the Corvette on the roof. Apple Hill Orchard 1175 Lexington- Ontario Rd., Mansfield 419-884-1500, Free admission. Not only can you pick your own fruit when it’s in season, Apple Hill Orchard also has a small petting zoo, a working bee hive that you can view and the best fresh apple doughnuts I’ve ever tasted! I can hardly resist stopping by just to grab a dozen! Drive-in theaters are quickly becoming a thing of the past and it’s harder and harder to find them operating these days. Why not make some family memories, load up on snacks and bug spray and head off to the next feature film that appeals to your family? Springmill Drive-in also offers movies on two screens so you have more options. Planning a trip to the drive-in? 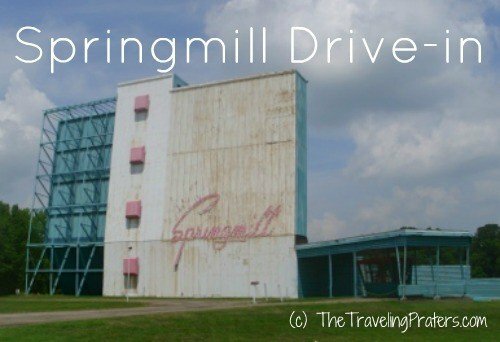 Read my tips for visiting the Springmill Drive-in. The Mansfield area has not one, but two drive-in theaters. The Sunset Drive-in is a short drive from Mansfield. The Mansfield Art Center 700 Marion Avenue Mansfield 19-756-1700. Open Tues-Sun 11-5. Free. Viewing art at the Mansfield Art Center begins as soon as pull into the parking lot and view the building. Stunning architecture outside, frequently changing exhibits inside make this a stop that’s sure to be appreciated by the budding artists in your home- both young and old. 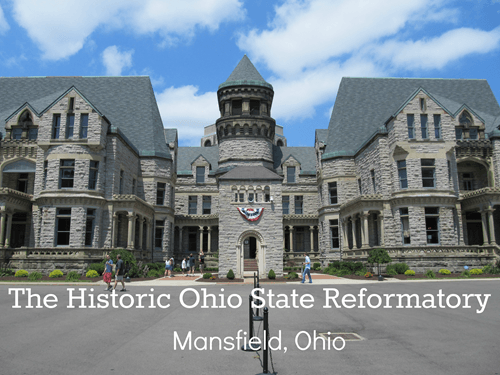 The Historic Ohio State Reformatory 100 Reformatory Rd., Mansfield 419-522-2644, Prices are $9 for self-guided tours for adults/$7 for youth, seniors, military and college students/additional add an additional $5 for audio tour rental or guided tour. View the website for up to date hours and tour options. This historic structure is one of the top five castle like structures in the US and houses the world’s largest free standing cell block. It has also been home to four major motion pictures, which include Tango and Cash, Air Force One and the Shawshank Redemption which has led to an attraction all it’s own, the Shawshank Trail. The trail begins at the reformatory, but takes you on a journey to 13 other sites in the area where the movie was filmed. Biblewalk 500 Tingley Avenue, Mansfield 419-524-0139, Prices begin around $4.75 depending on the tour. Discounted rates are available for families and AAA members. 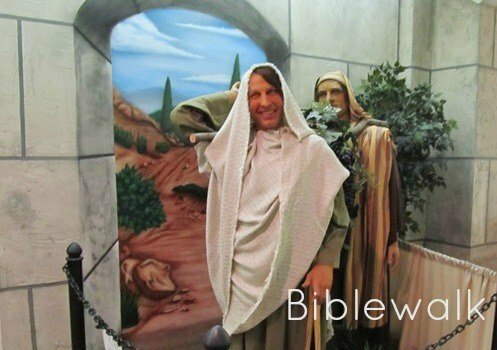 Biblewalk brings the bible to life with scenes depicting life size wax figures and mannequins. You can choose one or more tours that include the Old and New Testament, specifically the Life of Christ and Miracles of the Old Testament, Christian Martyrs and the Heart of the Reformation. Biblewalk is also home to some amazing folk art, woodcarvings and a rare collection of old bibles. This Comfort Inn Hotel not only offers lodging, but also an indoor water park for guests to enjoy. It’s hard to resist the looping water slide, hot tubs, floating raft and gushing geysers! Day passes are often available, making this an affordable and fun stop on your next Staycation. Richland County B & O Bike Trail stretches just over 18 miles from Mansfield to Butler, Free access. A favorite attraction among locals, this smooth, paved bike trail provides an opportunity for bikers, walkers, runners and roller bladers a safe place to exercise in a beautiful scenic location. 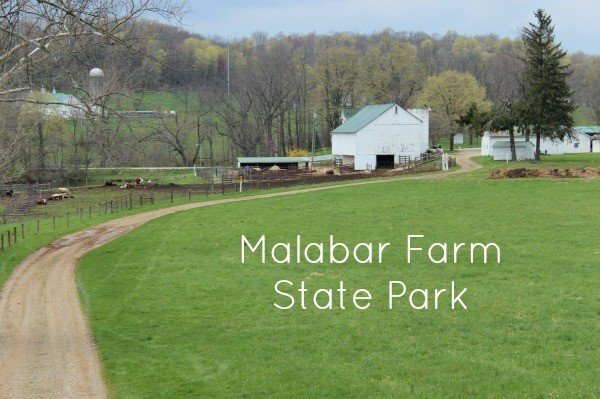 Malabar Farm State Park 4050 Bromfield Rd., Lucas 419-892-2784, Free admission to the farm. Small fee for home tours. A short drive from Mansfield, Malabar Farm was home to esteemed author and Pulitzer Prize winner, Louis Bromfield. Built in the beautiful rolling hills of the Pleasant Valley, the Big House at Malabar Farm served as the setting for Humphrey Bogart and Lauren Bacall’s wedding. Today you can tour the home (for a small fee), pet the animals in the barn, fish in the pond and stroll along the many trails, one of which that leads to a small cave that you can enter and explore. Malabar Farm is a nature lover’s dream. With a new state of the art Visitor’s Center and Songbird Aviary, and regular festivals and activities throughout the year, it seems that there is always something going on at Malabar Farm. Oak Hill Cottage 310 Springmill St., Mansfield 419-514-1765, Tours begin at $5 for adults and $1 for children. After your visit to Malabar Farm, don’t miss the opportunity to visit Oak Hill Cottage where Louis Bromfield’s cousin lived. Not only is this home a wonderful example of gothic architecture, it was also written about in Bromfield’s book, Shane’s Castle. So, what do you think? Will you be traveling this summer or staying close to home? How about a trip to Mansfield, Ohio? I lived in Ohio for many years and never heard of any of these places. They all look like so much fun! If I go back to visit again, I’m definitely going to have to check some of these out. My kids would totally love exploring them with me that’s for sure. We live in GA, but drove through there after a visit to my aunt in Cuyahoga Falls. We saw a few of those sites, but I wish I’d know about all there was to see. Next time we visit, we will have to spend a little more time in Mansfield. The reformatory is gorgeous! I’d love to come out there and take a day or two. Seems like a neat place to visit. I so wished I lived closer to Ohio. I live in California and have heard of so many fun places to see in Ohio. Don’t let this website for you, most of the things on it can be checked out in 5 minutes and they charge to do anything that isn’t a county park. $5 to look in a tiny little house? No thanks. Ohio is awful, the people are awful and the weather is even worse. I’ve never been any place in the country the charges you to rent movies from the library but they even charge for that here. Wow, I’m sorry to hear that you think Ohio is so awful. I admit I didn’t truly appreciate Ohio until we moved then it wasn’t so bad. And those other places I lived, some of them did charge for movie rentals. No big deal for me, as it was still cheaper than renting from Blockbuster.